Run along a river, though a beautiful park, to a bay! The inland city of Bayamón, just southwest of San Juan, has perhaps one of the best long distance running routes on the island of Puerto Rico. 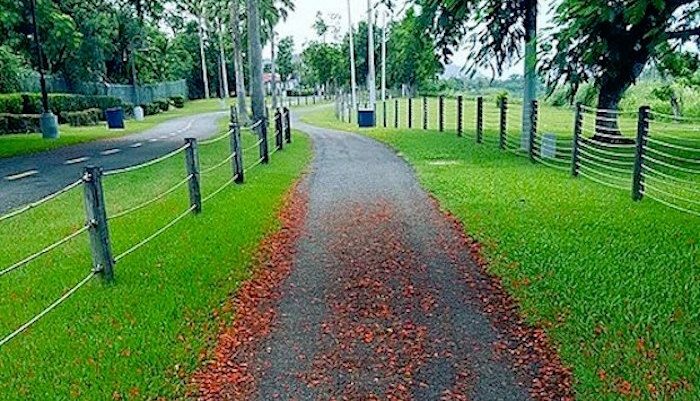 This extensive pathway along Bayamón’s namesake river starts at the golf course near the University and continues 5.5 miles north on an asphalt track, surrounded by a beautifully manicured linear park. At the north end, it meets the bay (Ensenada de Boca Vieja), just west of San Juan. For most of the way, the path is separated into two lanes for cyclists and runners/pedestrians. Runners can find exercise equipment and rest stops with bathrooms and water at various points along the way. If you’re not up for running the whole 11 miles, locals suggest starting out at the Cambija parking lot. From here, it’s a 6 mile out and back to the beach, or a nice 4 mile out and back with hills and river views in the opposite direction.